Threaded BB for 386EVO frames and 22/24mm diameter spindle cranks. Machined cups thread together for stability, increased bearing life, and simple installation and maintenance. Wheels Mfg 386EVO BB for use with 24/22mm spindle cranks will not work with Quarq SRAM/GXP cranksets (Elsa, Riken, SRAM Red 22, SRAM S975, SRAM S2275, CinQo Saturn, Saturn2). If your Quarq spider has an ID less than 49.5mm, your crank may rub on the BB cup. 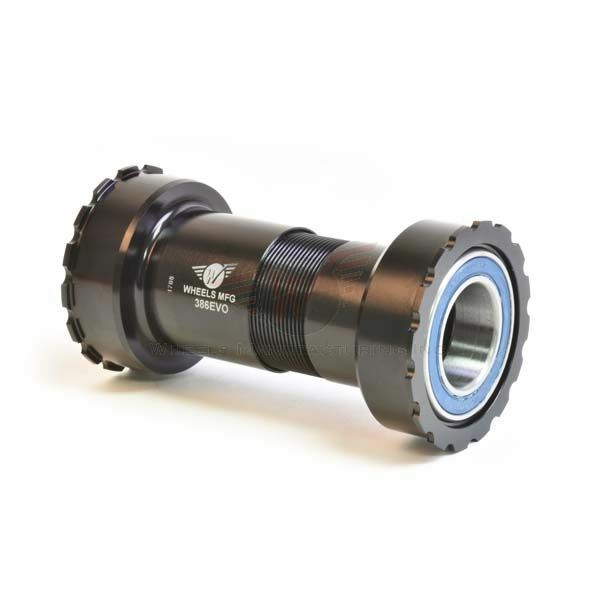 Compatible with Quarq DZero powermeter spiders with GXP spindles except Eagle MTB.